and they have a contract with a local interpretation organization so that nutrition counseling can be made available to all families. The FECEP/HS program firmly believes that parents are a child’s first, and most important, teacher. Therefore, they work to ensure that FECEP/HS parents are provided numerous opportunities to gain nutrition knowledge. Every month, the program provides at least one nutrition education opportunity in the form of grocery tours or cooking classes. The tours allow nutrition staff to personally take families through a grocery store and assist families in learning how to read food labels and save money on seasonal produce. Cooking classes allow nutrition staff to discuss healthy cooking options and techniques and how to incorporate MyPlate into meals. These opportunities are provided in a different area of the county each month and at different times of the day to give parents numerous opportunities to attend. Each year, nutrition-based meetings are provided to families to allow the nutrition staff the chance to discuss the importance of incorporating family-style meals at home, physical activity as a family, and planning out meals to save money. Family breakfast happens two times a year in each classroom where teachers invite parents to eat breakfast with their student. These parent breakfasts often will have a hands-on food activity to support eating a healthy breakfast. FECEP/HS is a winner of the 2015 Let’s Move! Child Care Recognition event at the 2015 National Child and Adult Care Food Program (CACFP) Sponsor Association Conference. Tiana Kamen, started the Farm to Keiki (child) movement in Hawaiʻi as her way to give “aloha” back to her home. 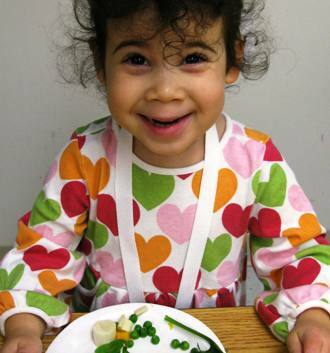 This program focuses on building life-long healthy eating habits of preschool-aged children by establishing their connection with nature and fresh, locally-grown foods while food preferences are developing. MyPlate now has easy-to-follow tip sheets–perfect to post on the refrigerator or as a take-home for parents. Topics include: Kid-Friendly Veggies and Fruits, Eating Better on a Budget, Cut Back on Kids’ Sweet Treats and many more. Search by age group and topic. Also available in Spanish.